BigTechLiquidation Cosmetic condition: ---Has sings of cosmetic wear as scuffs and marks,minor scratches. Please see pictures for details. Functional condition: ---Fully Functional. Included: ---iPod ---Charging cable ---Headphones Not Included: ---Any Other Accessories. Our Policies: Payment: Tax Policy: ⦁ Buyers from Ohio state will be charged 8 % sales tax. Shipping and delivery details: ⦁ Make sure that shipping address is correct and matches address provided by Pay Pal. ⦁ We DO NOT ship to APO, FPO or PO BOX address or military bases. ⦁ If your address is not correct or is not confirmed by Pay Pal, we are not responsible for safe delivery. ⦁ We are not able to change or modify the address before or after item is shipped. MODEL: A1367. 32GB | BLACK | WIFI. iPOD TOUCH. 4TH GENERATION. TOUCHSCREEN IS UNRESPONSIVE NEAR THE TOP OF THE SCREEN SEE PICS 4 AND 5 FOR EXAMPLE. BATTERY DEPLETES FASTER THAN NORMAL. Apple Ipod Touch - 4th Generation (A1367) - 32 GB - White - used. This ipod has been factory reset and is in good working condition. It has a storage capacity of 32 GB. The battery life is untested. The 4th Generation iPod Touch in many ways has all the capabilities of the iPhone 4 without the cellular capability. This iPod has a ‘Grade A’ screen and is in great condition with great picture quality and brightness. 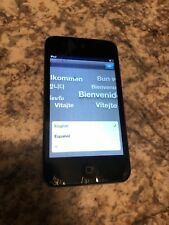 Apple iPod touch 4th Generation Black (32 GB) Works Perfectly. A1367. Condition is Used. Has some smudges/scratches , See Pictures!! -Tested, Fully Functional & Operational!! -wiped back to Factory Specs !! Pretty mad at the darn system and how was it hacked. Maybe your itunes still works. Reset ready for new "User". THIS IS A VERY NICE APPLE IPOD TOUCH 4TH GENERATION. BOUGHT PRE-OWNED FOR MY SON FOR CHRISTMAS BUT NEEDED THE 5TH GENERATION FOR APPLE MUSIC. WE SET IT UP AND EVERYTHING IS FUNCTIONAL. Apple iPod Touch 32GB. No case, cord or accessories, just the iPod. Go retro, great for using that old speaker dock and playing your music or streaming. Includes the exact iPod as shown. No charging/data cable included. It's in good used condition and working great. Up for sale is an Apple iPod Touch 4 th Generation 32GB (Model A1367) White. Headphone Jack Functional:YES. The following 16 point check has been completed on this iPod. Charging Port Functional:YES. We cannot resolve an issue I am unaware of. Power supplies, cords, cables, batteries, and other basic accessories. Sunnking, Inc. is an R2/RIOS certified electronics recycler. This item has been tested by our technician and is functional! All settings have been reset to factory. This ipod has been tested by our technician and is functional! The settings have been reset to factory. There are scratches along the screen and back case from previous use. are NOT included unless stated otherwise. Very nice ipod touch for sale. Screen still has plastic protection screen on it. So no scratches on screen, wear and tear on back of ipod but comes with red protection cover. Does not come with charger. Apple iPod Touch 4th Generation Black 32GB. Condition is Used (see pics). Home button is not as responsive as before but assistive touch will be your good help. No original box, no charge cable. Shipped with USPS First Class Package. A1367 Product Condition iPod Manufacturer Part Number Apple Manufacturer Apple Item Condition This item has been Tested for Key Functions, Ready for Resale. Item(s) will have a 4"x2" internal inventory label, see pictures. Apple 2010 iPod Touch Black 32GB (4th Gen/FaceTime) A1367 ++FREE SHIP! Looks clean. Check out the manufacture's website to get the correct and latest product information. Don't let the item pass by! The actual accessories included with this item, may be different in style, color or condition. Apple iPod Touch 4th Generation 32GB - Model A1367 With Charging Cable. Condition is Used. Some normal scuffs on back. Please see photos for details. Shipped with USPS First Class Package. Charging cable is third party and brand new. 2 - 16gb (one is the 1st gen.). Model -iPod 1st, 2nd and 4th Generations. Make -Apple. Apple iPod Touch (32 GB) A1367 White. Condition is Used. Shipped with USPS First Class Package. Used iTouch 4th generation 32GB, and has scratches from normal wear but still works very well! Comes with purple case pictured. New condition and open box. FOR APPLE COLLECTORS . Software Updated ios 6.1.6 released 2014 for 4th generation ipod touch. All pictures are taken in house. opportunity to work with you in resolving any issues. Since we're a liquidation house that deals with many vendors and have thousands of products online, it. Cash is only accepted for will-calls (in-person). Device is in very good used cosmetic condition with normal signs of wear. Device is in 100% WORKING condition. It has been extensively tested and found to be fully functional. iOS can only be upgraded as high as version 6.1.6. Newer apps will NOT work with this device! This listing includes iPod Touch 4th Gen 32GB model A1367 and Apple USB sync cable. Front panel is black and back panel is silver. Photos are for generic purposes only and are NOT the actual device you will receive!. Unit is clean. All buttons work. We will help to resolve any issues quickly and fairly. This item is in good condition and fully functional with only minor blemishes from normal use. Alaska and. Unit is fully functional.